Plywood laminated with ABS, aluminum or fiberglass is available in thickness from 1/8" to 1/2" in a variety of colours. 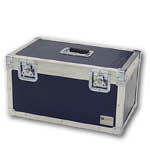 Laminate cases offer you excellent performance characteristics at an affordable price. Designs are limited only by your imagination. 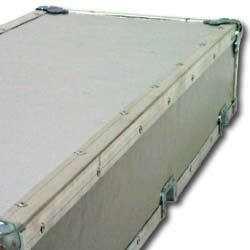 Virtually any size case can be fabricated from standard 4x8 sheets. Hardware can be recessed or surface mounted depending on your requirements. To further enhance the appearance of your cases, logos and other corporate identification can be applied to the case shells by silk screening. Upon initial inspection, most laminate cases appear to be identical. Nothing could be farther from the truth. If you were to disassemble a laminate case from 6 different manufacturers, you would probably find 6 different construction methods. Which method is best? Let's take a look. Look at the rivets used to construct the shell. Not just on the corners, latches and handles. Look at the aluminum extrusions. Are the extrusions riveted to the case? Are they "pop" rivets or are they smooth dome-shaped rivets? "Pop" rivets are easy to remove and replace in the field in the event of damage. Nothing more than a cordless drill and an inexpensive rivet tool are necessary. Split rivets (dome-shaped) are installed using a piece of stationary equipment that is not available for field repairs (unless your field happens to be the factory that produced the case in the first place). 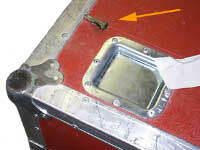 In the field the only practical repair is to replace the split rivet with a "pop" rivet. Makes you wonder why "pop" rivets weren't used in the first place. The reason is simple: Faster assembly, cheaper to manufacture. It costs more to manually drill and install "pop" rivets than to use mechanically installed split rivets. At ECM, we only use "pop" rivets. Some cases have no visible rivets on the aluminum extrusions. If you look inside the case you'll probably find that the extrusions are stapled to the laminate panels. If you were able to remove the staples (difficult at best), you might find that the extrusions are glued to the laminate panels. The result of this method of construction is a case that has a slightly cleaner look (a matter of opinion). The fact (not the opinion) is, stapled and/or glued cases are difficult to repair in the event of damage. One other fact is revealed by this method of construction. The extrusions that are used to hold the case together have to be thin enough for a staple to penetrate. Our custom fabricated extrusions are too thick and rigid to allow the use of staples. Why then do manufacturers use staples and/or glue? Again the reason is simple: Faster assembly, cheaper to manufacture. If you found no rivets, no staples, and no glue to attach the extrusions to the case... find a manufacturer that cares about your needs, not just their bottom line. 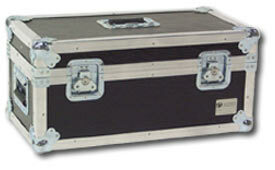 At Engineered Case Manufacturers, we take great pride in the durability of our laminate cases. Aside from the laminate itself, aluminum extrusions are perhaps the most important component of a case shell. The strength and rigidity of these extrusions has a direct relationship to the overall robustness of the case shell. Unsatisfied with the stock extrusions available, we've made the commitment to designing and manufacturing custom aluminum extrusions to our own specifications. We offer you these products for the same price that others charge for stock extrusions. A perfect example of our commitment can be seen in our lidmaker extrusions. What is lidmaker? A typical case lid is constructed using a top panel, 4 side panels, a double edge extrusion to hold them all together and a tongue or groove extrusion to allow the lid to mate to the case body. Sounds like a lot of parts. It is. There are also inherent design limitations in a typical lid, one being the minimum size required to accommodate all those parts as well as any necessary hardware such as latches and corners. Lidmaker reduces the number of lid components to 2; the top panel and the lidmaker extrusion. Lidmaker combines the double edge, the lid side panels and the groove in one strong, compact, attractive extrusion. You benefit because you can maximize useable area inside the case itself instead of having to waste space accommodating an outdated lid design. At Engineered Case Manufacturers we use a lidmaker extrusion of our own design. Ours is beefier and substantially more rigid than the standard off-the-shelf lidmaker used by everyone else. We also offer you something that nobody else can: A lidmaker extrusion designed for 1/2" laminate. Now you can have all the advantages of lidmaker in your heavy duty cases and racks. Please note that this chart should be used as a reference only! Actual colours may vary. ABS laminate is available in all colours shown. Fiberglass laminate is available in Black, Light Gray and Dark Blue.